314 pages | 2 B/W Illus. Increasingly, the modern neo-liberal world marginalises any notion of religion or spirituality, leaving little or no room for the sacred in the public sphere. While this process advances, the conservative and harmful behaviours associated with some religions and their adherents exacerbate this marginalisation by driving out those who remain religious or spiritual. And all of this is seen through the lens of social science, which seems to agree that religion remains important, if not in spiritual sense, at least as a source of folklore and a means of identification: religions remain rooted in the societies from which they emerged, and the legal systems of many of those societies emerged from religious sources, even if those societies remain unwilling to admit that fact. In the modern materialistic world of conformity, religion is less a source of guidance than a label of identification. The world therefore faces two issues. First, the decreasing level of spirituality in the ‘West’ widens the gap between worshippers and those who have left their faith (eg agnostics and atheists, or those who look at religion as a matter of ‘picking and choosing’ from a range of options). And, second, the strong connections to religion which remain in many nations, but which are often misused in the secular public sphere (both in the West and internationally). In such divided worlds, both religious and secular forces tend to lock themselves into closed groupings of ‘pure truth’ and in so doing increase the level of disagreement, in turn producing radicalism. In short, the modern world is divided in two ways: between religious and non-religious (although some have argued that the non-religious secular is itself a form of civil religion), and between those subscribing to divergent understandings of the same religious tradition. While hyperbolic and histrionic, the term ‘culture wars’ nonetheless best captures what we see happening in the public sphere today. The question emerges, then: how best to accommodate the democratic principle which posits that the majority should feel that it lives in a society of its own with the human rights principle, holding that is necessary to ensure the full protection of the minority’s rights? How to balance these seemingly opposed principles? We are very familiar with the differences that appear between secular and sacred in the modern world; yet, what of the similarities amongst scriptures and laws which seek to encourage mutual understanding, cooperation and even cohabitation? Because religion itself is a source of law, a set of exhortations or commands as much as a set of rights, every major religion offers an approach to encountering ‘the Other’ in a positive, constructive, affirming way; and it is here that religions reveal much that they have in common. This book draws together the work of scholars engaged in exploring the possibilities for a ‘utopian’ world in the sense fostered by St Thomas More. 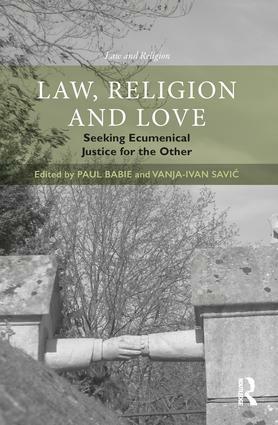 The essays explore those dimensions of religious and civil law where ‘love’ – however that is defined by relevant texts – fosters and encourages acceptance of ‘the Other’ and will offer perspectives on the ways in which religious or civil/state law command one to act in the spirit of ‘love’. Paul Babie holds a Personal Chair of Law and is Associate Dean of Law (International) in the Adelaide Law School, The University of Adelaide, Australia. Vanja-Ivan Savic is Assistant Professor of Law in the Faculty of Law of the University of Zagreb, Croatia.